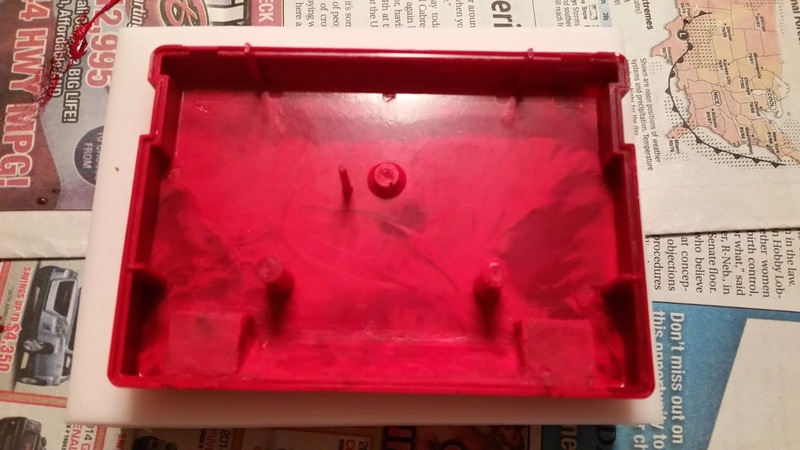 When last we left our intrepid crafter, we saw a completed silicone mold of the top half of a cartridge case. Now, let's put something in it! 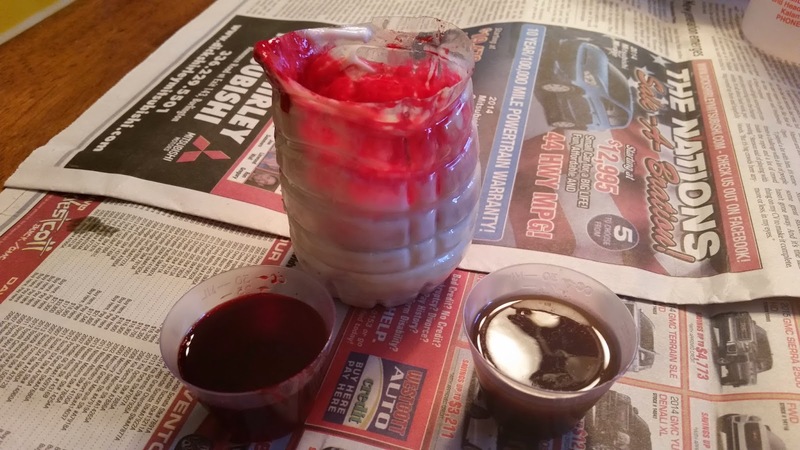 The mold is to be filled with a plastic resin. There are a huge variety of resins available. They vary in material, color, transparency, flexiblity and hardness. Honestly, I haven't messed with this stuff enough to have a well-informed opinion on the various choices. I do find that the materials available at my local hobby store seem to be adequate for the task at hand and are relatively easy to use. 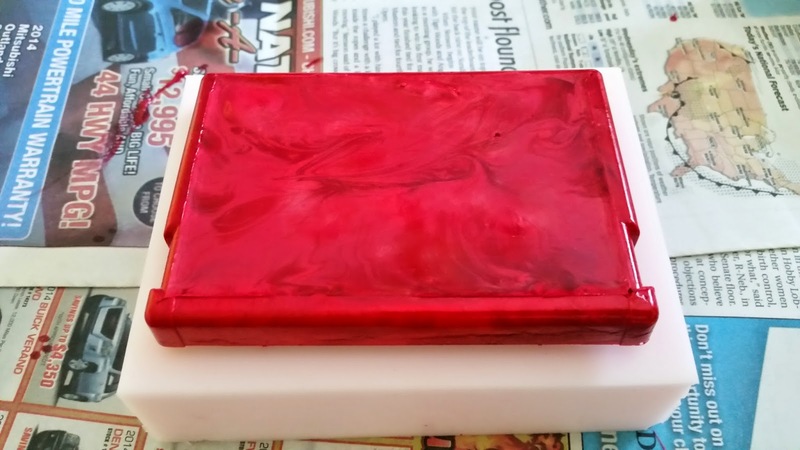 For this part of the project I am using a two-part resin that is designed for hobbyist use. 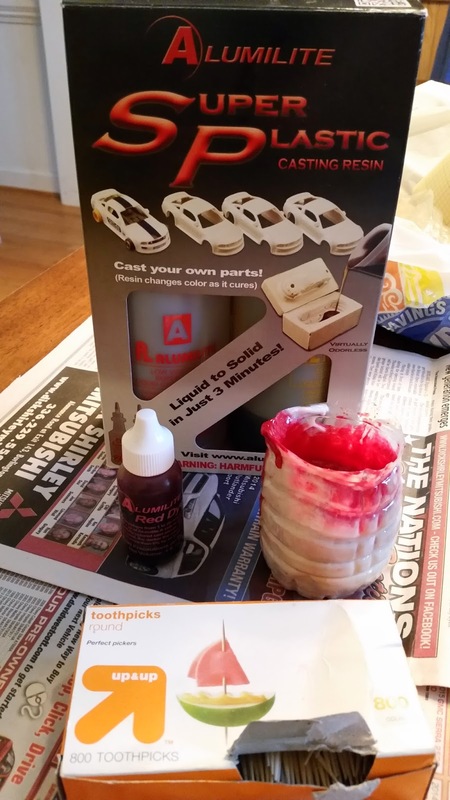 The picture on the box shows someone making a plastic car model. Some other products seem go be geared more towards people making decorative tchotchke items for flower pots, home decor, or whatever. Look around your local hobby store and I'm sure you can find something similar. Other items shown are a piece cut from the bottom of a water bottle, and some toothpicks. The bottle bottom is where I mix the two parts of the resin right before pouring. 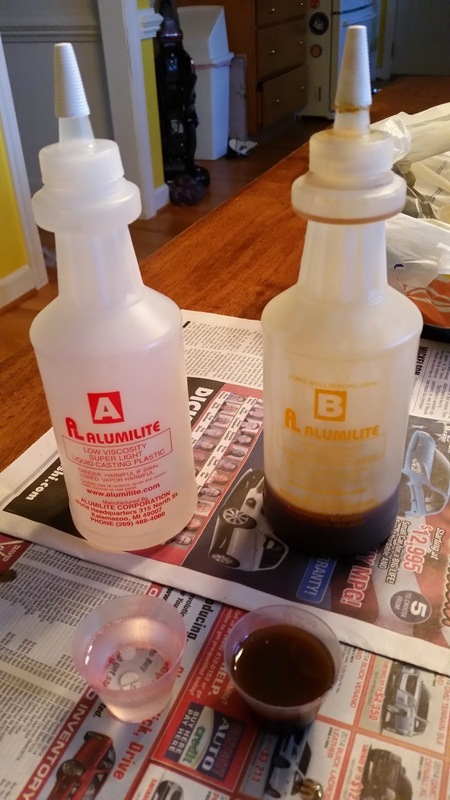 The left over bits of the resin stick to the container used for the pour, so a disposable or recyclable container is needed unless you want to ruin your household items! A toothpick is used to probe low parts of the mold in hopes of releasing air bubbles after the pour. 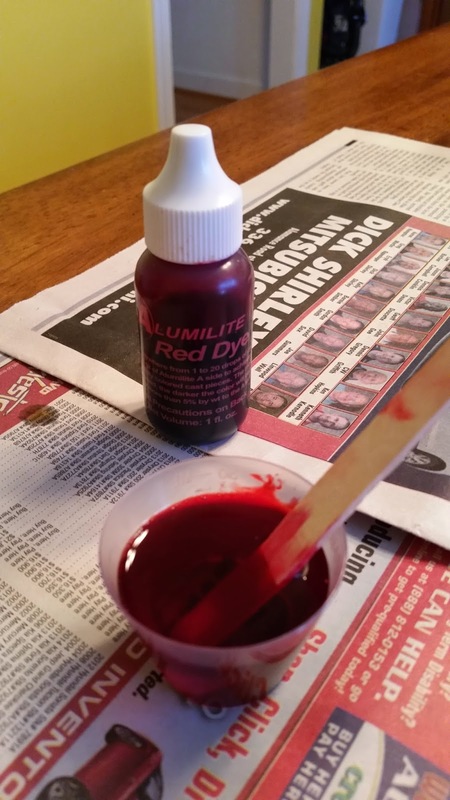 The resin shown cures very quickly -- there is only about 90 seconds of pour time! This makes it difficult to get a good mix, and causes some anxiety during the pour. The item shown below was already hardening while I was still probing it with a toothpick, resulting in some irregularities near the surface toward the bottom. 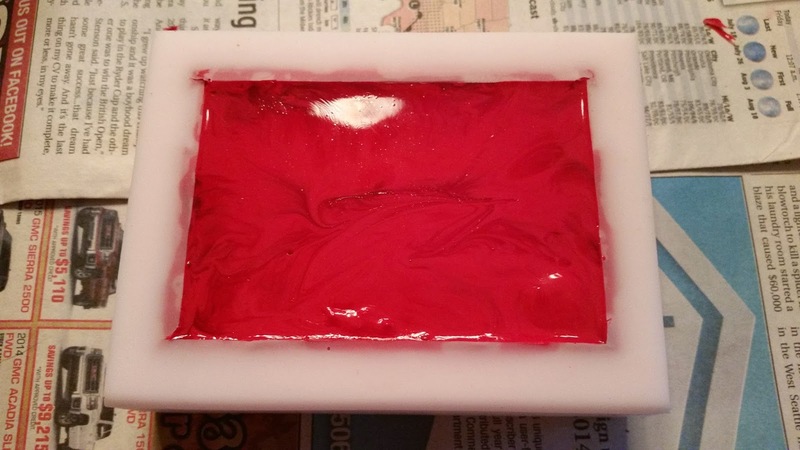 The plastic is hard enough to pull it from the mold within a few minutes, but I find that leaving it in the mold for 45+ minutes tends to get better results. Otherwise it is sometimes still soft enough to deform or even to get some blistering on the surface of the parts. Just be patient, and the parts will tend to come-out well! Close inspection of the top of the piece reviews some roughness at the edges of where the mold openings had been. Some casting flash is inevitable with either a one-part or a two-part mold, so this is not unexpected. A little sanding will remove the roughness, albeit at the expense of the shiny finish on the top of the part. If you want to learn more about that and other post-casting finish work, then you'll have to stay tuned! content is fine and the conclusion is good. Trying several ways to ping you. I sent an email.